Forget spot the ball, can you spot the offense? Worksop Town centre-half Ross Henshaw goes in for what looks like a 50-50 challenge with the Abbey Hey goalkeeper. And then, as the video – which contains strong language – shows, all hell breaks loose in the FA Cup clash. Henshaw is hurled to the ground twice, first by the keeper and then by another home player. A third Abbey Hey player steams in and seems to land a punch, with the red card coming out straight away. When the dust settles, Henshaw too is sent from the field. Unless Henshaw was being red carded for his attempt to win the ball from the goalkeeper – which is hard to believe because the referee didn’t whistle to halt play – it’s difficult to see why he was given his marching orders. And if play was still live when the keeper tangles with Henshaw, why is it not a penalty to Worksop? A yellow card for the goalkeeper seems lenient, to say the least. 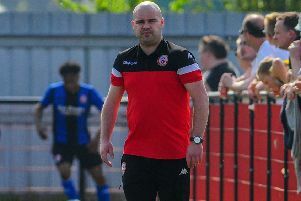 Tigers boss Mark Shaw called the decision ‘digraceful’ but said Abbey Hey were worth their place in the next round, after a lacklustre display by the visitors.